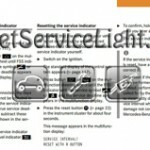 Reset service light indicator Mercedes CL Class W215. From years: 2000, 2001, 2002, 2003, 2004. How to reset service light indicator Mercedes CL Class W215. From years: 2000, 2001, 2002, 2003. Press button (UP arrow) or (DOWN arrow) on the multifunction steering wheel until the FSS indicator with (Single Wrench) or (Double Wrench) and the service deadline appears in the multifunction display. Picture below. Press the reset button R in the instrument cluster for about 4 seconds. This message appears in the multifunction display SERVICE INTERVAL? RESET WITH R BUTTON To confirm hold down the reset button until you hear a signal. The service indicator now displays the reset interval. 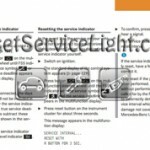 The full procedure how to reset service light indicator Mercedes CL Class W215 is taken owners manual. How do you reset service light indicator Mercedes CL Class W215. From year: 2004. Press the reset button R in the instrument cluster for about 3 seconds. This message appears in the multifunction display SERVICE INTERVAL? RESET WITH R BUTTON FOR 3 SECONDS To confirm hold down the reset button until you hear a signal. 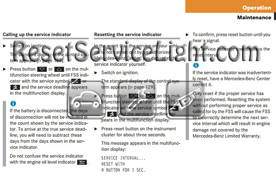 All information how to reset service light indicator Mercedes CL Class W215 is taken owners manual. 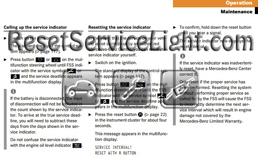 That it is the full procedure how to reset service light indicator Mercedes CL CLass W215. If you like to reset any maintenance oil light after an oil change. Or reset check engine light, airbag light, inspection key or insp errors when maint reqd, for Mercedes-Benz cars. Or any warning light for service reminder which appears on the display. Write in the search box the car name for which you want to find information, and find how to reset other service reminders when by yourself. Click hear to see full procedure how do you reset the oil light indicator. 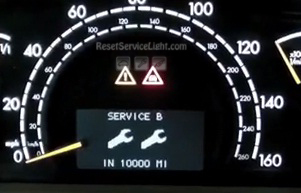 How to reset the maintenance light and how do you reset service light for all Mercedes Benz vehicles. I wasn’t able to find on your site how to remove the light for model W215 year 2003 for removing airbag light and abc visit workshop light. Damaged seat belts or belts that were highly stressed in a accident must be replaced and their anchoring points must also be checked. Use only belts installed or supplied by an authorized Mercedes Benz center.